Panther’s Pixy Crane is a lightweight, highly portable camera crane with a maximum reach of 14′ and a maximum payload of up to 25kg in weight. The Pixy can also be rigged as a short jib arm that can in turn be mounted onto a Husky dolly for tracking jib movements. In addition to this, we also stock a Panther Trixy Remote Head that allows a single operator 2-axis control of a camera, along with lens control for broadcast-style lenses such as the Fujinon Cabrio series. 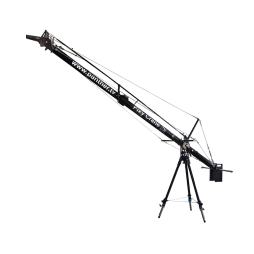 The Cartoni JIBO is a compact and portable jib with a maximum payload of 20kg and a maximum reach of 68″. 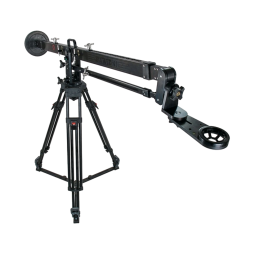 This lightweight jib packs away into a wheeled flight case and is quick enough to set up that it can be used on the fly when on location – this is the perfect jib for adding production value to your documentaries or low-budget promos. The JIBO also allows the camera head to under-slung for low-mode shots or in portrait mode, which is particularly useful for fashion and website banner projects.